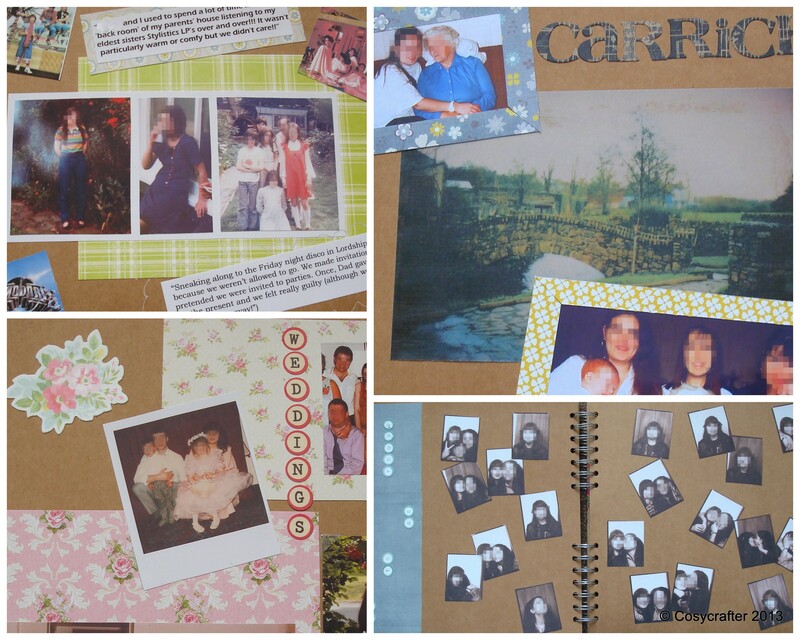 It was my mother’s 50th birthday recently, so I decided to put together a scrapbook with memories and photos of her life. It was an idea that only came to me about 3 weeks before the day, so realising I was cutting it fine, I emailed her siblings and friends for any photos and stories they had. They sent me some lovely pictures of her as a child, some from family visits to Cyprus and one phoned me with some memories of her as a teenager. As my mum had us at a young age, I really wanted to get some information about her before she was a mother. I spent a bit of time looking up dates, television shows and music from the decades when she was a child and teenager. 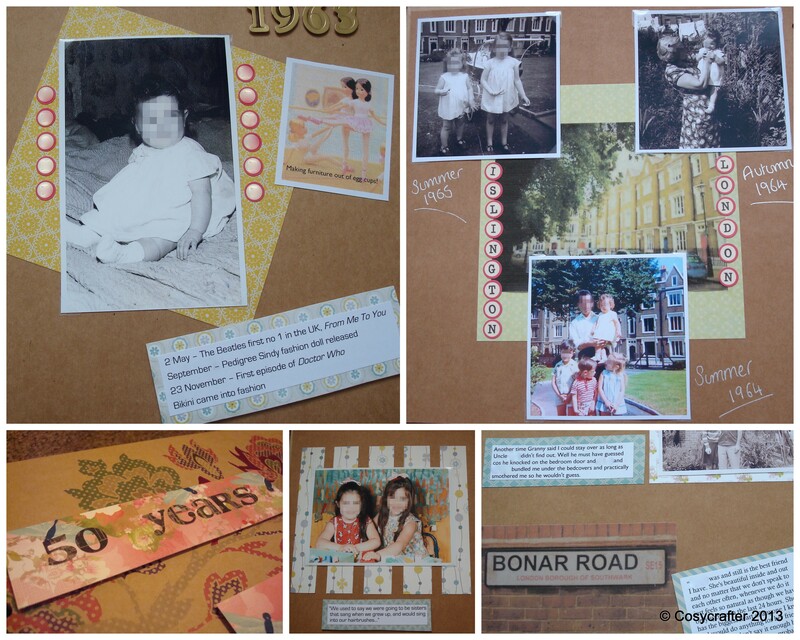 I vaguely knew of something called ‘scrapbooking’, although the examples that I found online looked a little too detailed for the timeframe I’d given myself. After posting a message asking for some assistance, someone very kindly pointed me to some websites for acid-free paper and a variety of adhesives, such as glue dots – who knew! I already had a simple Kraft scrapbook from Paperchase and some 6 x 6 acid-free paper (Papermania: Summer Bloom, Papermania: Rose Garden and K Co: Sparkly Sweet). Eventually, after an afternoon spent browsing the amazing Papermaze, I bought Pink Paislee: Indigo Bleu 6 x 6 paper, October Afternoon: Boarding Pass alphabet stickers and BasicGrey: Serenade alpha stickers. I thought the paper was a bit more muted than the bright floral paper I already had and the stickers had a nice retro feel to them. Next, I bought a small glue dot dispenser, some adhesive foam pads and some photo corners – I had already decided not to use originals as scanning would allow me to enhance some of the older photos, but thought that using photo corners for some of the pages might look neater. After editing and printing all the photos, I looked up the various Word fonts to see which ones could be used for printing stories and messages – I wanted the fonts to match the decade the story came from. My brother contributed some pictures and phrases from her favourite football team and football manager, and my husband put together some cds with the UK number 1 singles that occurred every year on her birthday. I also printed some maps and pictures of areas on to vellum paper as a backing to some of the groups of photos and handmade some cd cases. Finally it was time to put it all together. My original plan was to do a year or decade arrangement, but there were big gaps (in terms of photos not being taken, no stories etc) so I put more focus into the early part of her life and then grouped together other areas – weddings, kids, cats, football. 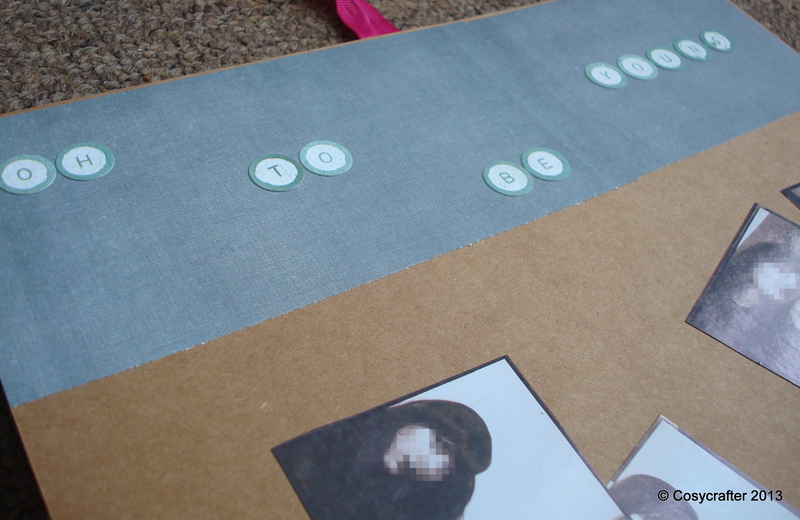 There were a lot of pages left which I thought could be used to put together any other photos that she might like. My favourite page was a selection of pictures that had been taken in a photo booth with her friend. She looked so young and carefree and was having a lot of fun. When I arranged them on the paper, it looked a bit like a notice board, so I didn’t back them with anything else and simply used a piece of paper with the words ‘oh to be young’ in stickers down the side. So that was that! I kept it rather basic as you can see, partly because of the time and partly because I didn’t think I quite had the skills to put together that many beautiful pages. However, it was about the photos and memories more than the design, so hopefully it fulfilled its purpose. What a wonderful and thoughtful gift for your mom! Beautiful!